When it comes to going on holiday, especially during the winter, the costs can add up. From snug clothes so you can hit the slopes without catching a cold, to the cost of hot food and drinks to warm you up after a day in the snow, the costs can add up. While a short term loan is there in the case of an emergency, we’ve looked into ways to save you money from the moment you book your holiday until you leave. Staying in a chalet while you’re on your skiing holiday can help you save money simply because you’ll know how much you’ll be spending. Chalet-board can include a cooked breakfast, afternoon tea, three-course dinners every day except for the host’s day off and unlimited wine is often included if you shop around. Chalet stays are arguably more comfortable too, with the comforts of home adding an extra bit of cosiness to your break. When it comes to going all-inclusive, it can seem expensive when considering the initial price, but ultimately it means that that is the only cost you might have to endure during your holiday. Most ski holiday packages will include the flights, transfers to your hotel, full-board accommodation, drinks, equipment hire, ski school, lift passes and more. An all-inclusive holiday will stop you from needing to pay out much, if any, money on essentials. You’re protected from the offset, not having to worry about having money to pay for food and transfers during your stay. Packing your own lunches – if you haven’t gone all inclusive – will save you money in the long run. You won’t be paying out for lunches while you’re out on the slopes where the food can be a less than desirable price. It can be cheaper, but also give you a better range of options for what you bring with you to eat. A lot of ski slopes even have picnic areas for those that bring their own food, so it can be well worth taking a trip to the local supermarket to pick up things to make lunch or to snack on while you’re out. Like with any holiday, booking you ski break last minute can help you save money. Holidaymakers aren’t going to want to lose money, so they’ll discount the cost of their rooms at the last minute to make sure that they’re filled, rather than leaving them empty. While this might feel risky, if you can be flexible about where you’re going and when, it’s worth taking the risk. Tour operators in particular bring out good deals, especially around the Christmas and heavy winter periods. Second hand clothing can be just as good as brand new, and is often much cheaper. 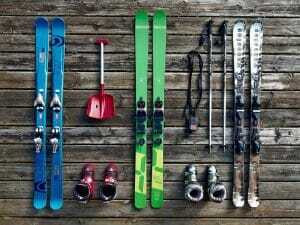 When it comes to skiing, the clothing is notorious for being expensive if you want the ‘right’ things. Curb the costs by looking into buying things second hand or online to cut the prices a little more. If you have clothes leftover from a previous skiing trip and they still fit, wear them again rather than buy things new – it’s unlikely you’ll see the same people you have before and why not get the most out of your purchases?